I recently became a GUMI Mum, a blogger ambassador for GrowingUpMilkinfo.com, a toddler nutrition website that is on a mission to talk more about toddler development and nutrition, especially the importance of vitamin D.
The website has a collection of interesting and educational news stories, polls and videos, as well as recipes from toddler chef Fiona Faulkner. 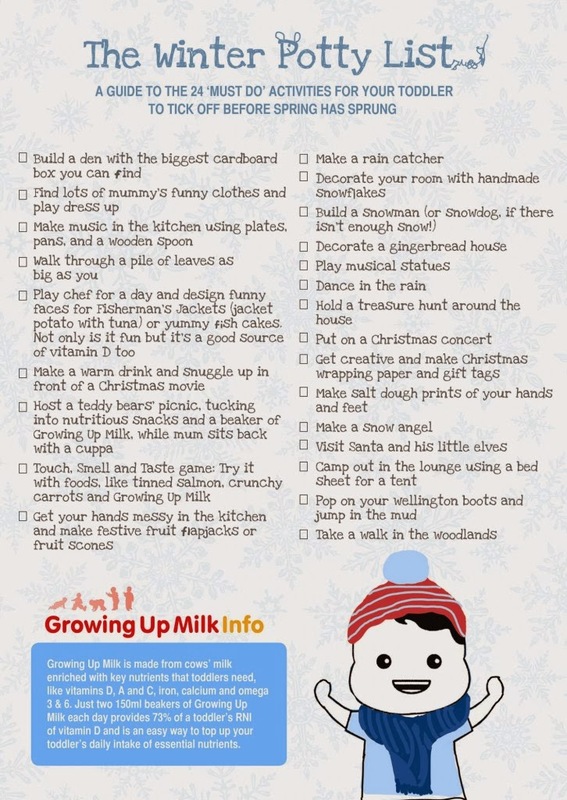 The people at GrowingUpMilkinfo.com have created a Winter Potty List, a rather fun list of 21 must-do winter games, activities and experiences for parents to enjoy with our little ones before spring has sprung. These include a few vitamin D inspired games to give all of us that much needed vitamin D boost through the cold months. Lots of time outdoors no matter what the weather along with a healthy and balanced diet are important ways for little ones to boost their vitamin D reserves. So how many of the Winter Potty List have you ticked off already? Take a look, you won't ever be stuck for something to do on a cold winter's day. Disclaimer: This post has been written in collaboration with GrowingUpMilkInfo.com as part of their GUMI Mum (Growing Up Milk Info Mums) blogger ambassador programme. Growingupmilkinfo.com is a resource created by Cow & Gate and Aptamil, part of DANONE Baby Nutrition. What a sweet idea! My little one has only just started crawling (backwards!) so it'll be a little while before we hit these but I've saved the image! Thanks Belle. Hope you enjoy doing some of these things as your little one grows up. What a fab list, especially with half term coming up! If the weather carries on like this, we are all going to need some inspiration to get through half-term! That's a really good list for some ideas. Good mix of indoor and outdoor play, I think. Love the list. Dancing in the rain's always been a favourite of mine! We still have a few to get through. Thanks for the list.. perfect for when my Grandson comes to visit. I never know what to do to keep him entertained. It is hard work trying to think of things to keep the little ones occupied. Vitamin D deficiency is on the rise. My youngest son was borderline Ricketts level without us having any idea! Mine is a teenager now :D But a lovely list! Let's hope the snow falls so snow angels can be made! Useful list, I'm busy working out how many we have done already. I like lists. Just help keep everything in focus.